The Rocky Mountain Antiquarian Booksellers Association (RMABA) is an organization of used and rare bookdealers in the Rocky Mountain West including Colorado, Montana, Utah, New Mexico, and Wyoming. 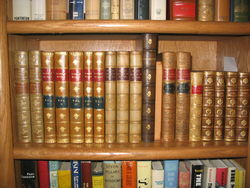 The organization is dedicated to stimulating book collecting, promoting ethical trade in all facets of the antiquarian book business, and educating the public in the field of antiquarian books. Each year RMABA sponsors the Rocky Mountain Book and Paper Fair the first weekend in August in Denver, Colorado and offers two scholarships to the Colorado Antiquarian Book Seminar in Colorado Springs, Colorado, the week following the book fair.